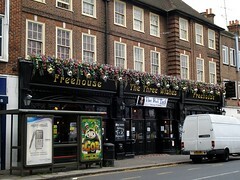 Formerly known as The Blacking Bottle, this is a large but friendly pub fairly near Edgware Station. Inside, there's an open area in front of the bar, and a number of cosy booths off to the side. Patterned carpet on the floor, and quite a lot of dark wood panelling and mirrors. There's a dartboard toward the back. When Kat and Rick visited in August 2007, well-kept London Pride was available. On Kake and Katie's visit in September 2008, they'd given up on selling real ale, although three handpumps were still visible; the chap behind the bar told us they just hadn't been able to sell enough of it. We had Strongbow instead (£2.75/pint). However, when Kake and Katie visited again in October 2011, they again had real ale on: Greene King IPA (can't remember the price). A pint of lime and soda on this latest visit was £1.10. A sign spotted in September 2008 advertised live music every Saturday, and as of November 2011 their website says there's live music every Monday and Saturday (on our Monday early-evening visit in October 2011, there was no evidence of this, though we may have been too early). Accessibility: Shallow step at the entrance which has been smoothed over to make a short but steep ramp. We saw someone come up it in a power chair, but unsure about how a manual wheelchair would cope with it. Didn't see an accessible toilet, and the doorway into the ladies' is a bit narrow. Last visited by Kake and Katie, October 2011. Last edited 2011-11-05 13:52:34 (version 8; diff). List all versions. Page last edited 2011-11-05 13:52:34 (version 8).